The Prakash Utsav of Sri Guru Harkrishan Sahib Ji was celebrated with great obeisance and religious fervor at Sri Guru Harkrishan Sr. Sec. Public School,40-C, on 31st July , 2011. Hon’ble S. Charanjit Singh Chadha, President, Chief Khalsa Diwan, Amritsar, was the Chief Guest. S. Inderpreet Singh Chadha,Chairman of 63rd All India Sikh Educational Conference also graced the function. The esteemed members of school managing committee joined the staff, students and guests of honour for the celebrations. The function started with the bhog of sehej path Sri Guru Granth Sahib Ji at 9.30 am. 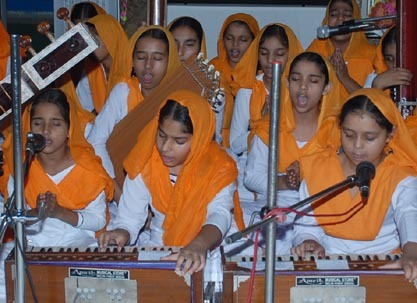 The school choir started the shabad gayan and the program continued with kirtan by Raagi Jatha. A team of students put forward the school report highlighting the academic, sports and cultural achievements of the school in the session 2010-11. Scholarships and Academic excellence awards were given away by the Chief Guest, S. Charanjit Singh Chadha ,President, Chief Khalsa Diwan, Amritsar. Scholarship of Rs.100 p.m. was given to 21 students from the economically weaker section. Amrit Pal Singh & Bhupinder Pal Singh received the scholarship of Rs. 500 p.m. for scoring above 90% marks in class X Board Examination. Palakpreet Kaur, Shivani Verma and Aanchal received scholarship of Rs. 300 p.m. for scoring above 85% marks in the class X Board Examination 2010-2011 . Six students were awarded scholarship of Rs 100 p.m. for their excellent performance in the field of sports, Music & Divinity. Manjot Singh and Parminder Singh Basra of class XII were honoured for their meritorious result in class XII Board Examination 2010-2011. S. Charanjit Singh Chadha warmly appreciated the efforts of students who have excelled both in academics and sports. In his address, he emphasized the need to inculcate the moral values, efficiency & quality education amongst the student community. S. Pritam Singh, President, Chief Khalsa Diwan, Local Committee, Chandigarh,thanked the dignitaries for taking their valuable time off their busy schedule and participating in the celebrations. He also expressed thanks to the parents who had made the function a grand success. The program concluded with the school shabad Deh Shiva bar mohe, Path Anand Sahib , and Ardas which was followed by Guru Ka Langar.